Here are just a few highlights of some of the Youth Group mission trips! When I signed up to go on the Youth Mission Trip to Hiawassee, GA, I wasn’t sure what to expect. It was my first week long mission trip with the youth. 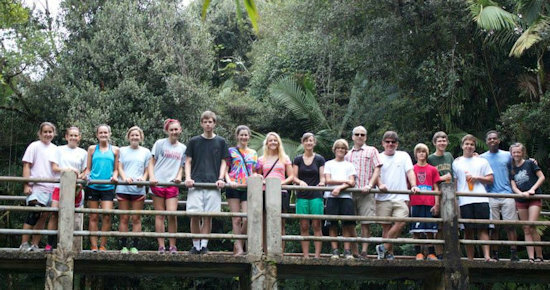 I remember going on mission trips as a youth myself and genuinely enjoyed them, but this trip had a more profound impact on me as a person and a Christian than any trip I had ever been on as a youth. We started our week off bright and early on Monday morning. I learned pretty quickly that some of our youth were early risers, while others required 4-6 alarms. We broke off into three work groups and headed to our work sites. At our first work site, the kids were excited to start working. Although some of the tasks were not ideal, I enjoyed watching my group’s eagerness to do whatever needed to be done to help the family. We switched job sites on our third day. We arrived at a sweet elderly lady’s home named Miss Rosie. Before we could start working, we had to wait for our site manager to arrive. Miss Rosie had chairs set out for all of us to sit in. While we all sat there talking and learning about Miss Rosie, I found myself smiling as I looked at each youth’s face. They were all captivated by Miss Rosie’s story. It was in this moment that I not only felt God’s presence but I saw it in every youth’s face, as well as Miss Rosie’s. In Miss Rosie’s house, we replaced the floor in two different bedrooms. To do this, we had to rip the carpet out of both rooms, cut out the damaged floor, replace it with new wood, and lay down the laminate floor. This may have been my favorite project we did all week. In one room we had Blair, Hannah, Carley, Cammie, Marley, Peyton, and Ava ripping out carpet. I don’t know if you’ve ever watched someone rip out carpet that has never done it before, but Peyton and Ava seemed to have fun doing it. Blair was the master at cutting a straight line in the floor with the circular saw so that Hannah could rip the damaged pieces of floor out. In the other room, Shevan was the master of the circular saw, while Kira was a pro at ripping the floor out. 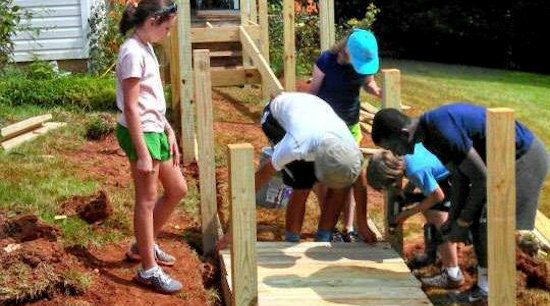 Not only do the youth learn useful knowledge about home repairs, using tools, and teamwork, but they all bond in a way that you don’t see on other trips. I watched Hayley and Blair take Peyton under their wings and teach her how to put up drywall; Kira teaching Ava and Shevan how to rip out carpet; and Zack and Jacob fixing the floor in a bathroom. Regardless of the task at hand, all of our youth embraced the younger youth; teaching them, guiding them, being positive role models and importantly their friends. I genuinely feel like these trips help the youth to develop bonds with each other that not only last through their entire youth experience, but also for a lifetime. Trips like this not only offer the youth a different platform to experience their faith, but also it gives them the opportunity to interact and give back to those less fortunate. It allows them to actively express God’s love through action. It was a blessing to be able to go on this mission trip with the youth and I look forward to future trips. In summer 2013, our high school youth spent a week living in Puerto Rico and our middle school youth spent a week living in Washington D.C. open to the ways they might see God in the places they were serving. For our Summer Mission Trip 2012, the youth went to Montgomery, AL to experience the culture and to be involved in some of the city ministries that operate there. For this week, we lived in a local church building. Our theme for the week, Oh, No He Dih’int, was designed to draw attention to the ways Jesus stood up for people and did what God calls us to do even when he knew it wouldn’t be easy. We connected our trip and theme with the Civil Rights Movement focusing on youth who were important to the movement. We also learned about other Civil Rights leaders we may not have known much about before this trip. The hope was that our youth be able to talk about the act of standing up for what is right not only as a good thing, but as a gospel thing to do and an act of faith. For our Summer Mission Trip 2011, the youth went to San Francisco, CA to experience the culture and to be involved in some of the city ministries that operate there. 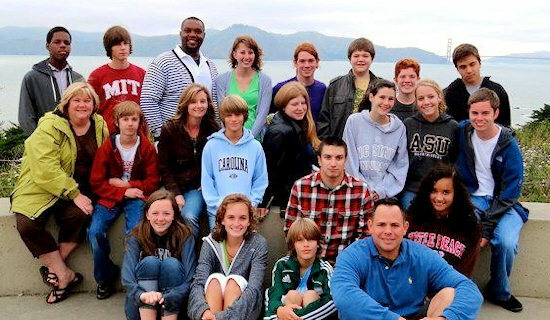 For this week, we lived in a local church building with a local youth group and Passport staff. The work we did within San Francisco had a significantly influenced our youth. During the week we learned about human trafficking and the helped organize a donation room that serves women who have come there for refuge, helped portion food at a food bank the size of Costco, prepared food for Open Hands, an organization that provides food for people living with AIDS, cooked and served food for the people living in a new local apartment development, and we painted a local church. This part of our trip was significant because our youth formed relationships with the other youth with whom they were serving. The youth were exposed to and learned from a community and a culture with which they were not familiar before this trip.